Among all of the musical idioms of the world Brasilian music must be one of the most seductive; the most attracting of musicians no matter what their compulsion. But let it be known that mastering their complex and myriad rhythms is no easy task. Samba is deceptively simple, but ever tried to dance correctly to it? And then it gets more exciting and challenging: capoeira, frevo, maracatú, xôte, and the list goes on as the music and dance gets more dizzying. Still the brave and the foolhardy alike never tire of attempting music and dance in the Brasilian metaphor. 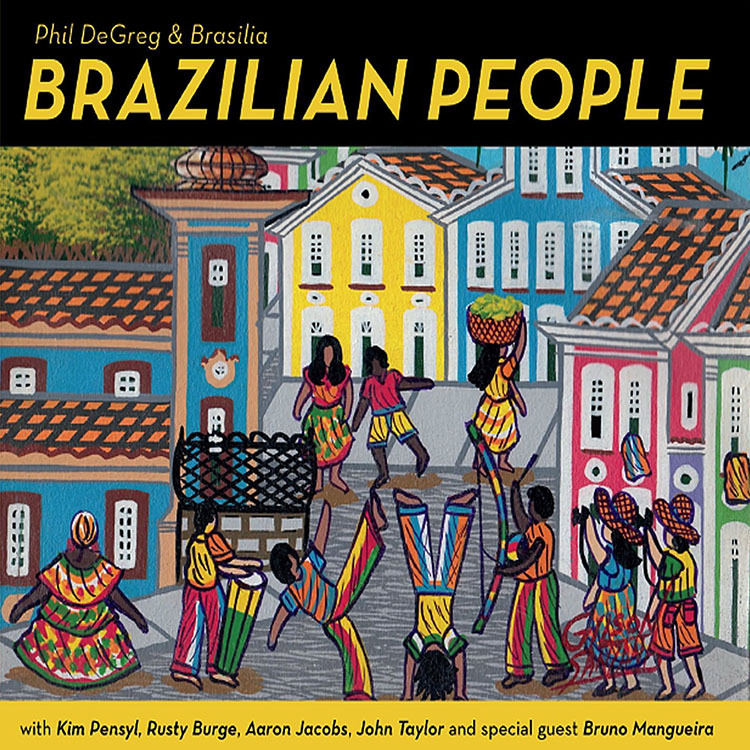 There is a little bit of both in Phil DeGreg: a kind of reckless ingenuity that makes this album, Brazilian People really worth listening to. More than once. There is something here that suggests the music belongs to the rollicking rhythms of the streets rather than the relative facile elegance of a concert hall, though the rustic charm of Brasilian music also has a place there sometimes. However, like a frevo in Pernambuco, the greatest enjoyment might be gained from experiencing the music and dance on the street. Brazilian People is authentically Brasilian. Anytime that Hermeto Pascoal appears on a collection of music then it is a sign that the musicians are making an effort to go deeper. And this recording begins with “Valley of the River,” a rarely heard gem from El Brujo, (“The Sorcerer”) as Hermeto Pascoal is affectionately regarded. His composition offers a peep into Mr. Pascoal’s world, which is beguiling and draws the listener in as if a monumental spell has been cast. Mr. DeGreg captures this spirit convincingly and with maximum animation. In one of several surprises here the melody is also expanded a bit to allow the song to take on a kind of life of its own, without being washed too far away from where Hermeto Pascoal wanted it to be. There are also three charts by Antonio Carlos Jobim and although they are somewhat predictable numbers the music reveals a firm control of (Bossa Nova) tempo while still providing ample room for expressive playing. Of course there is no way a recording that attempts to traverse the musical topography of Brasil without the work of Antonio Brasiliero, some important and monumental musicians are conspicuously absent: Vinicius De Moraes, Dorival Caymmi, João Gilberto… to name but a few. On the flipside João Bosco, Marco Silva and Edu Lobo (whose profoundly beautiful “On Lia’s Island, In Rosa’s Boat” is profoundly beautiful in Phil DeGreg’s hands) get an even shorter shrift, so the selection of charts achieves an ultimate balance anyway. And then there are the musicians themselves… all fine to a man. It is impossible to single out any one for special mention. All of them deserve the accolades they will receive in their time. And Phil DeGreg is not only a fine pianist, but also a worthy leader, who makes it all happen with class and finesse. Track List: Valley of the River; A Felicidade; Fresh Biscuits; Ano Novo (New Year); Brazilian People; A Yankee in Brazil; Café Com Pão; On Lia’s Island, In Rosa’s Boat; Double Rainbow; Triste.